Home » » Catching Fire LA Premiere on November 18th - Win Tickets! 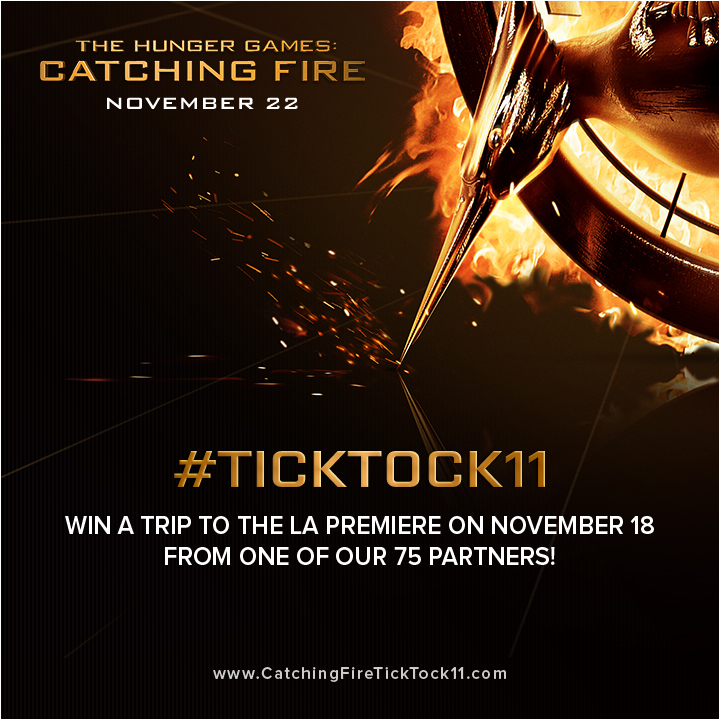 Catching Fire LA Premiere on November 18th - Win Tickets! #TickTock11 has been revealed! Lionsgate have announced that the LA premiere of Catching Fire will be happening on November 18th, and you can win a pair of tickets! Competitions will be held on the official Facebook app, and also via 75 official partner sites. The full list of partners can be viewed via the official TickTock11 app! HOW TO ENTER: Giveaway begins at 10 a.m. PT on September 11, 2013, and ends at 12 a.m. PT on September 25, 2013 (“Giveaway”). The winner of the “HUNGER GAMES: CATCHING FIRE LOS ANGELES PREMIERE” giveaway will be selected at random using Rafflecopter. The winner will be contacted by e-mail and will have 48 hours to respond and confirm his/her prize of two (2) “HUNGER GAMES: CATCHING FIRE LOS ANGELES PREMIERE Ticket.” To enter the giveaway, readers must abide from the site's specific guidelines as specified on the announcement post. Entrants for the “HUNGER GAMES: CATCHING FIRE LOS ANGELES PREMIERE” giveaway may not participate with multiple e-mail addresses. Any entrant who attempts to enter with multiple e-mail addresses, under multiple identities or uses any other device will be disqualified from participation in the promotion and all entries submitted by that entrant will be void. 1. ELIGIBILITY: Open to legal residents of the fifty (50) United States and District of Columbia who are 18 years of age or older at time of entry. Employees of LBC, its affiliates, subsidiaries, advertising and promotion agencies and their immediate family members and/or those living in the same household of each are not eligible to participate. WINNER SELECTION: Giveaway winners will be selected at random on or about September 25, 2013, from among all eligible entries received during the Giveaway. 2. Winners will be determined by the LBC. Winners will be notified by email. In the event the LBC is unable to contact the winner within 48 hours of first notification, prize will be forfeited and an alternate winner selected. 3. PRIZES: Two (2) “HUNGER GAMES: CATCHING FIRE LOS ANGELES PREMIERE.” Odds of winning Giveaway prize depend on total number of eligible entries received during the Giveaway. Unclaimed prizes will not be awarded. Limit one (1) prize per person for each promotion. 4. GENERAL: Subject to all federal, state and local laws/regulations. Neither LBC, nor its affiliates will have any liability whatsoever for any injuries, losses or damages of any kind caused by any prize or resulting from acceptance, possession, use and/or misuse of any prize or participation in these promotions. Acceptance of a prize shall be construed as and signify the winner’s agreement and consent that LBC may use the winner’s name, voice, likeness and/or prize information, without limitation, for promotional purposes without further consideration, review, approval or payment, where allowed by law. By participating in this promotion, entrants agree to be bound by the Official Rules and the decisions of the LBC, which are final and binding in all respects. LBC is not responsible for any typographical or other error in the printing of the offer or in administration of the promotion. 6. Winner’s name will be available no later than September 30, 2013 by email.